Corps Security have announced that Paul Lotter has been promoted to the role of managing director for their manned guarding business. 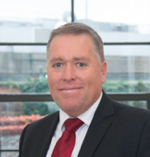 Lotter has been regional operations director for Corps, the UK’s most reputable security services provider, since June 2018. His focus has been on operations within London and the South of England, overseeing all aspects of service delivery to Corps’ customers. The new appointment comes at a pivotal time for the business, as it develops its suite of cutting-edge security solutions. In his new role, Lotter will look to strengthen Corps’ well-established manned guarding offer with the latest sensor and CCTV surveillance technology as well as its hospitality-focused concierge services. Lotter boasts more than 20 years’ experience in the security industry. Before joining Corps, he worked with various service providers across a range of high-profile corporate sites in the South West of England and around Greater London. His expertise lies in managing the strategic direction of all operational security requirements. Corps cites the appointment as reinvesting back into the operational side of the business. In his role as managing director, Lotter will work closely with the regional divisions of the organisation to ensure a high level of service is delivered consistently across the UK.